This electronic filter wheel from ZWO is most likely one the smallest 7-position filter wheels in the world. It is also extremely lightweight, it weighs 400g only. 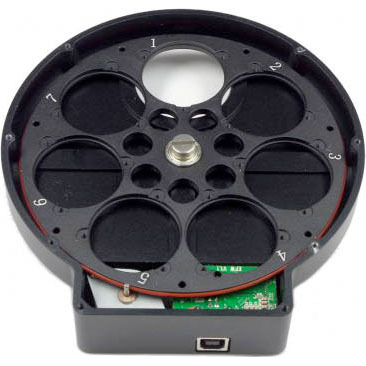 Up to 7 filters can be installed in the numbered compartments that accepts 36mm unmounted filters (or semi-mounted Astronomik filters), and each can be selected for your eyepiece or camera from an imaging software. The filter wheel can be attached to your focuser either by the supplied 1.25" nosepiece adaptor or via a T-thread. There is actually a female T-thread on both sides of the filter wheel, but it also comes with a reverse adapter with male T-thread on both sides. The robustly constructed filter wheel is supplied with a 1.25" nosepiece and a 1.25" eyepiece holder with brass compression ring. The distance between the filter and sensor is around 10-12mm when you connect the ASI1600 to this EFW, so a 36mm filter wonäó»t have vignetting with a scope with down to about f/1.2 focal ratio (depending on the thickness of the filter), which meets any demand in astronomy, therefore we would recommend this filter wheel for customers who might use it with various cameras, including one with APS-C sized sensor or simply for futureproofing, i.e. those who might upgrade their camera to an APS-C sized sensor in the future. Please note, these limiting ratio figures are slightly different from ZWO's own calculations and to be checked in practice.